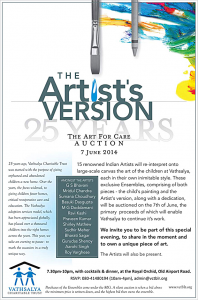 Indira Bhardwaj, of the erstwhile Right Lines Art Gallery called me up a few weeks ago asking if I would be willing to participate in a charity auction to help raise money for Vathsalya – an orphanage that is completing 25 years. The answer of course was yes. I almost bailed. But I guess somethings are meant to happen! One of the reference images was a Krishna. The answer was simple. I decided to finally finish the incomplete Krishna that had been on my living room wall for almost six years!! The piece is 42″ x 59″. Acrylics on canvas. And I call it ‘Krishna amidst the lotus‘. What does this painting mean to me? I have always tried to pay it forward in any way I can. And if it involves my work than so much the better. Doing this painting for Vatsalya was a no brainer. And while I was still pondering on what to paint, the Krishna painted by one of the Vatsalya children sort of leapt out at me. I had started a canvas of ‘Krishna and cows’ sometime ago but I always felt that I was unsure of where I wanted that painting to go artistically. So it sat in my studio as a rough sketch for a while and on my living room wall as a work in progress. Somehow once I had decided to work on the canvas again, it almost painted itself. The lotus motif has been a recurring theme in my work for a while now. I wanted to show Krishna nestled in the midst of lotus as he walks his cows home. I was also looking at working with an unusual perspective, both in terms of the placement of the cows and the dense foliage of lotus leaves. This canvas to me represents life itself. With it’s element of love- Krishna with his cows surrounding him and the fecundity of nature all around him. Strange are the ways of the universe, after such a mad rush to finish, this painting did not find it’s home. But there was salve for my wounded heart. Only 3 out of the 18 paintings displayed that day found buyers. I found my disappointment was greater for the painting not having raised the money that would help others finder a better life. In my mind this painting is pledged to raise money for something and someone deserving somewhere. I just need to figure out how to get the painting out there. To play match maker to both the prospective owner and the cause. To get money to the tune of 85K. So now I have other plans for it. This entry was posted in Acrylics, Event, Exhibition, Happy Happenings, Interiors. Bookmark the permalink. Aarohi,what shall I say ?! I am in the same boat my dear,a couple o’ years or more I too did a large Radha Krishna painting for the same cause in the same manner which again is lying with me.Especially because it does not belong to my genre it does not fit in with the rest of my work.